What are the three attributes of money and does gold have them? How to tell if a novel is well written. How is money a store of value. How is money a medium of exchange. How is money a unit of account. Video of Ron Paul and Ben Bernanke discussing gold starting around the 4 minute mark. Later, he said it was a financial asset in the same way Treasury bills are an asset. Paul then asked Bernanke why central banks hold gold. “It’s a form of reserve,” said Bernanke. “Why don’t they hold diamonds?” asked Paul. “Well, it’s tradition,” responded Bernanke. This is a fascinating conversation from the perspective of what was said and more importantly from what was not said. A standard definition of an asset is something of value that is owned. If money is a store of value, and an asset is something of value then money is an asset. Except what we typically think of as money in the U.S (i.e. the dollar bill) is also a liability. All U.S. dollar bills have the term “Federal Reserve Note” engraved at the top. There are $1.3 trillion worth of these Federal Reserve Notes in circulation according to the current Federal Reserve Balance sheet. Federal Reserve notes are listed under the liabilities section of the central bank’s balance sheet because a U.S. dollar bill is essentially unsecured debt issued by the Federal Reserve that has no maturity and pays no interest. The U.S. Congress has specified the Federal Reserve must hold collateral equal to the Federal Reserve notes outstanding. 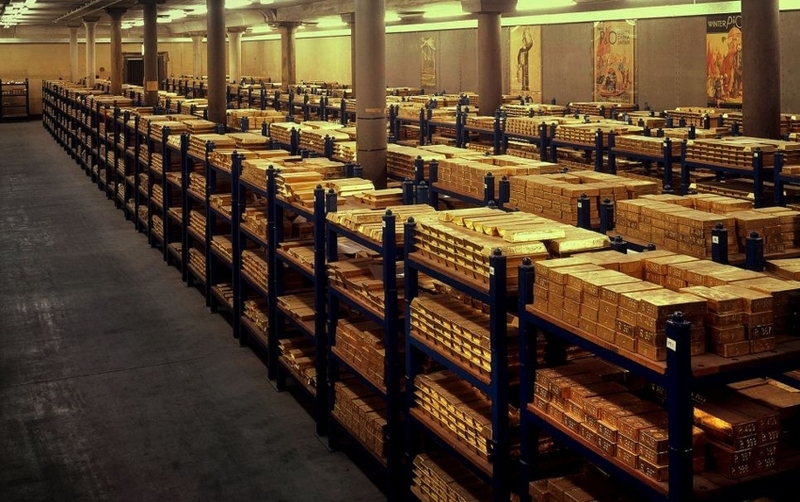 If the U.S. was still on the gold standard each of those notes would be backed by a specific amount of gold. That gold is the central bank reserves Bernanke mentioned. Except the U.S. Federal Reserve doesn’t own any gold. The Gold Reserve Act of 1934 required the Federal Reserve to transfer all of its gold to the U.S. Treasury. In its place, the Federal Reserve got gold certificates. Gold certificates are denominated in the U.S. dollar and are not redeemable. That means the Federal Reserve can’t take them to the U.S. Treasury and demand its gold back. In addition to gold certificates, the other collateral the U.S. Federal Reserve holds to back Federal Reserve notes outstanding are U.S. Treasury notes and bonds. Dollar bills are debts issued by the Federal Reserve that are backed by collateral that consists of other paper assets—gold certificates that cannot be redeemed and U.S. Treasury notes that are debts of the U.S. government that can be redeemed. What do you get if you redeem a U.S. Treasury bill? You get dollars, which in currency form are Federal Reserve notes. It is all a bit circular isn’t it? That means dollars are recognized by the court system as legal payment to satisfy debt obligations. Private debtors might take other forms of payment to satisfy debts but the only legal payment for debts citizens owe to the U.S. government in the form of taxes are U.S. dollars. This need to have dollars to pay taxes is a primary reason why dollars are the primary form of money. The U.S. collects taxes in dollars and it spends in dollars. Consequently, it is more efficient for businesses to pay employees in dollars, who then pay their taxes and buy things with dollars. This buying and selling and paying of debts in dollars is what is meant by money is a medium of exchange. We exchange things for dollars because we believe the dollar will holds its value (at least in the short-term), and there is an agreement as to what a dollar is worth. Since there is an agreement as to what a dollar is worth, it is a unit of account, satisfying the third definition of money. Trillions of dollars of assets and liabilities throughout the world are valued in U.S. dollars. Most of these assets and liabilities are never converted into paper currency. Even when an asset is just cash at a bank it is simply digits in an electronic accounting entry. Underlying this system of digital and paper money is a great deal of trust. Trust that the dollar will holds its value in the short term and others will recognize it as a medium of exchange. In that same conversation with Ron Paul, Ben Bernanke stated why people hold gold. They hold it in the event of “tail risk”, which are extreme small probability events. “Really, really bad outcomes” is how Bernanke termed it. Examples include severe financial crisis or the collapse of the monetary system because trust has been violated. Gold does not fit the traditional definition of money in that it isn’t typically used as a medium of exchange, and we don’t value assets and liabilities in terms of gold so it is not a unit of account. But gold has a significant advantage over the dollar. It has been a much better store of value over the long-term in that its value has outpaced inflation. That means an ounce a gold can buy the same if not more goods and services today than an ounce of gold could 50 years ago. That is not something that can be said for the dollar.